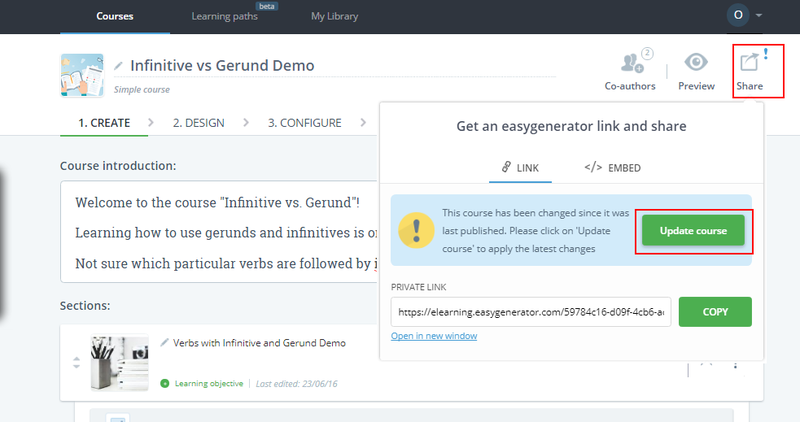 You can publish a course to Easygenerator cloud or your hosting, upload to your LMS, embed it on your website or sell via Coggno. By default, a course exists on the Easygenerator server and you are suggested to share a private link to access it. If your learners copy this link into their web browser, they will see the course and they can start working on it. That's the easiest way to publish and share courses. This option allows to generate the code that can be used to embed the course on your website. When the embed code is generated you can specify the frame size of your course. This option allows selling your course via Coggno, an online training marketplace and learning management system (LMS). You can publish your course in Coggno’s Marketplace and sell it to anyone, or you can publish it privately and use Coggno as your LMS. Learn more. This option allows publishing to LMS by downloading a course as the SCORM 1.2 package. The SCORM package is generated according to the SCORM 1.2 standards. It includes all referenced files and media and can be published to your LMS. A learner can save their current progress when a course is launched from the LMS. To save the current progress if a course is launched from the LMS a learner should click Save my current progress at the top right corner of the course. Next time a learner can easily continue passing the course from the saved position. Publishing to LMS by downloading the course as SCORM 1.2 package is a paid feature. You should upgrade your account to be able to publish to SCORM 1.2. This option allows publishing to your webserver or cloud storage by downloading a course as the HTML package. On the Courses page, when you hover over a course there is the Publish button. When you click on the Publish button it will bring you directly to the Publish step of the course editor from where you can select one of the available options. On the Publish step you can also create a whitelist of learners who will have access to the course. Learn more.